The Poco provides all the basics needed in a child carrier. It features a fixed, non-adjustable hipbelt, a mesh pocket with small zippered pouch and our Daylite daypack can also be attached using the built-in AddOn loops. 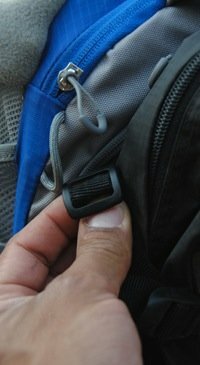 AddOn cord loops allow quick attachment of Osprey's Daylight daypack (sold separately). 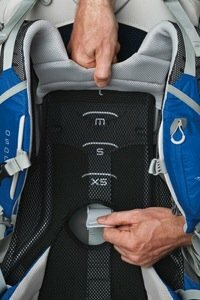 The Poco is Osprey's entry-level child carrier, with all the basics you need to make both parent and child comfortable on those long hikes down the trail or city sidewalk. It features a fixed, non-adjustable hip belt and a mesh pocket with small zippered pouch, and Osprey's Daylite daypack (sold separately) can also be attached using the built-in AddOn loops. The aluminum frame and hinges are stout yet lightweight, while ample padding throughout helps protect Mom and Dad's back while keeping the little passenger cozy. A hydration sleeve stows cleverly behind the back panel, and torso length adjustment is easy to tweak on the move.